Whales are the biggest animals to ever have existed on Earth, and yet some subsist on creatures the size of a paper clip. It's a relatively common factoid, but, in truth, how they do this is only just being uncovered, thanks to new technologies. What scientists do know is that a 160-ton blue whale's method for scooping krill is a tremendous endeavor. Swimming around 4 meters per second, it opens its triple-hinged jaws and takes in a gulp equal to about 140 percent of its mass, slowing back down to filter its snack and prepare for the next one. Blue whales feed nearly continuously when prey conditions are good during the feeding season, but for biologists, the exact mechanism remains a confounding feat of gigantic proportions. By attaching new sensor technology to whales just before they dive, researchers from Stanford's Hopkins Marine Station have captured this energetically expensive activity in more detail than ever before, which they report now in Current Biology. "This feeding process is facilitated by a complex suite of biomechanical and anatomical adaptations that together allow the whales to engulf a volume of water and prey that is larger than their own body," said co-author Jeremy Goldbogen, assistant professor of biology at Stanford. "For a large blue whale, this represents a volume of water and prey that is approximately the size of a large swimming pool or a school bus, and this is engulfed in a matter of seconds." "When these animals dive down to 300 meters, holding their breath for 12 minutes or more, they had better be sure it's worth the cost," said David Cade, lead author and PhD student in biology at Stanford. "To regain the energy lost, the prediction is that they are foraging on a pretty dense, rich resource." Sensors that record multiple facets of whale life have been around for about 15 years. Goldbogen has used them to study the reactions of blue whales to cargo ships and the lunge frequency of minke whales. These suction cup sensors can include a combination of accelerometers, magnetometers, and pressure and sound recorders. To figure out which model of feeding was more accurate, Stanford researchers worked with other whale researchers and engineers to develop a sensor package that housed miniaturized versions of typical movement technology plus new video recording capabilities. They attached these tags to whales in South Africa, Patagonia, and off the west and east coasts of the United States. 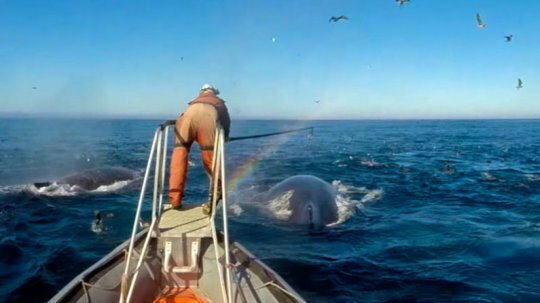 The resulting video is what you would see if you were riding on the whale's back. "Combining these two modalities is really eye-opening," said Cade. "Every time we do a deployment, we get something back that's new and interesting." The researchers found that whales that fed on krill followed a distinct pattern of activity. As Goldbogen hypothesized, they opened their mouth at peak speed and closed it around the time they were back to normal speed. Humpbacks that fed on fish, however, varied their timing. This is likely in response to the more advanced escape abilities of fish compared to krill; the whales may be performing lunge feeding that is less energetically ideal when the trade-off is eating prey that can supply them with more energy. Effective Oct. 11, most populations of humpback whales will be removed from the endangered species list. Even accounting for that change, three of the eight species of rorquals are endangered. There is insufficient data to determine the status for three other species in this family. Any attempt to ensure the survival of these giants will require us to know much more about them, including the particulars of their mealtime activities. "Because they operate on an energetic knife-edge, any changes in the environment related to their food supply could have profound impacts on individual and population health," said Goldbogen. This research could also help us better determine the impact whales have on our ocean resources. Whales have previously been blamed for reduction in fish populations but, although there are estimates, we don't actually know how much a whale eats, said Cade. These predators have played important roles in our ecosystem for millions of years, and the mass removal of them has had a poorly understood effect on ocean ecology as a whole. Learning more about rorqual feeding habits can support conservation efforts while also furthering insights into ecosystem processes that have direct effects on human fisheries. As for their part, the Hopkins researchers hope to dive deeper into whale feeding studies, including figuring out the fluid mechanics of their iconic baleen, which acts as a high-throughput filter to process the vast amounts of small prey. Additional authors on this paper include Ari S. Friedlaender of Oregon State University and John Calambokidis of Cascadia Research Collective. The study, titled "Kinematic Diversity in Rorqual Whale Feeding Mechanisms," is published in Current Biology. Materials provided by Stanford University. Original written by Taylor Kubota.